YAP, Federated States of Micronesia (NNS) – Two medical staff officers from the Japanese Air Self-Defense Force and a medical assistant petty officer from the British Army helped a Yapese patient who experienced a medical emergency during Pacific Partnership 2018 in Yap, Federated States of Micronesia, 23 March. Lt. Col. Ichiro Matsuura, Capt. Ryuya Maejima and Cpl. Darren Phillips treated a patient with a severed radial artery during a Community Health Engagement held at the Yap Memorial Hospital. The 67-year-old patient arrived with two tourniquets on his arm while bleeding from his wrist. That morning, while cleaning around his home, the knife used to clear out overgrown branches broke and struck his wrist causing what could have been fatal blood loss if it had not been treated in time. The three medical professionals are part of a team of more than 35 Sailors, Soldiers and Airmen serving as audiologists, veterinarians, primary care physicians, medical technicians, dentists, dental technicians and nurses from U.S., United Kingdom, Australia and Japan. Throughout the procedure, two nurses and a doctor from the hospital provided continual support to the operating medical staff including intravenous equipment and liquids, morphine and tourniquets. The U.S. and the Federated States of Micronesia continue a long history of friendship, having participated in the Pacific Partnership mission as host nation for five years with many Micronesia men and women having served or currently serving in the U.S. armed forces. 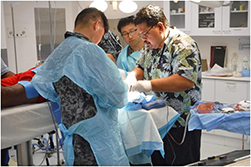 Since 2006, 22 partner nations around the globe in 18 host nations have participated in Pacific Partnership providing medical care to more than 300,000 patients, veterinary services to nearly 40,000 animals and completed nearly 200 engineering projects while building meaningful and close partnerships throughout the region.